Bankimchandra Chatterjee’s Krishna Charitra. M.P. Birla Foundation, Calcutta. 1991. The first English translation from Bengali. 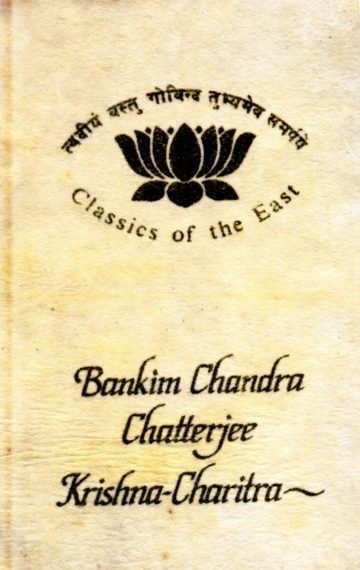 Krishna Charitra is a famous Bengali classic where Bankim Chandra endeavours to discover Sri Krishna, the real person, behind centuries of myths and legends. Written in 1886, this was the first instance where the character of Krishna is studied from a pragmatic and questioning perspective. Like his novel Ananda Math, Krishna Charitra originates from Bankim Chandraís passionate feeling of patriotism. He wanted to uphold Sri Krishna as not just a mythological figure, but an ideal Indian character, whom other Indians could look up to. “Pradip Bhattacharya and M. P. Birla Foundation deserve the gratitude of all the serious students of the Mahabharata. The translation is almost word-perfect…He has been able to capture the flow and the difficult and complicated syntax used by Bankim…very successfully captured that distinguishing atmosphere that is essentially Bankim…The introduction contains some interesting information hitherto little-known…The Bibliography…is very exhaustive…This work of translation is a production of very high order. The printing, the binding, the get-up etc. are excellent.” Maj. Gl. S.K. Sen, Vyasa’s Mahabharata: Creative Insights, Vol. 2, ed. Padma Sri Prof. P. Lal (Writers Workshop), The Statesman. “Truly meritorious translation…It is no routine exercise, but a labour of love and dedication.” Dr. K. R. Srinivasa Iyengar. “I am very glad to have this important translation in my library…what I have checked seems excellent.” Dr. Julius Lipner, Faculty of Divinity, University of Cambridge. “Bhattacharya, a noted scholar on the Mahabharata with several works on the subject to his credit, certainly accomplishes a fine translation of a difficult work… But what is more, he enriches the work in the light of research subsequent to Bankimchandra’s… He also provides in the Appendix, notes on references to works and persons left unannotated by Bankimchandra as well as English rendering of Sanskrit verses the author quoted only in their original.” Prof. Manoj Das, The Hindu. “The style is racy and invigorating, facilitating understanding of the original essay…The abstruse Indian ontology propounded by Bankim has been lucidly and elegantly conveyed.” Prof. Debal Kr. Chakravarti, Vyasa’s Mahabharata: Creative Insights,Vol. 2, ed. Padma Sri Prof. P. Lal (Writers Workshop, Calcutta). “A monumental work…I do not think that anybody working on Mahabharata or Lord Krishna can afford to neglect this work…Publication and printing is flawless and matches to the standards of the contents of the book. The M. P. Birla Foundation deserves congratulations.” Prof. Jodh Singh, Head, Department of Religious Studies, Punjabi University, The Journal of Religious Studies. “excellent translation”. Dr. Hans Harder, Universität Halle, Germany.